This test fixture uses a linear actuator instead of a the threaded bolt to apply pressure to the device under test. A separate excitation unit includes a pair of pulse generators that are activated by the external control programme (and the direction control also). In conjunction with the load cell a closed loop force control compensates for thermal expansion / contraction effects as the fixture temperature varies. As with the manual fixture, there are the heater units (each is still nominally 230V at 500W) and the flow sensor, load cell and thermocouples which can interface to your own instrumentation and system control or be part of a complete system that TCS can supply. Regarding the water supply for the cold block, you can either use your own water supply (the cheaper options is to connect to a tap and draining into a sink). We offer a closed-loop chiller unit that provides very accurate (and adjustable) set temperature. 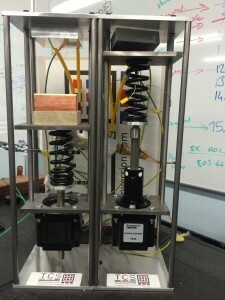 In either case the test rig measures the temperature input and output and, with the flow sensor, can be used to compute the heat flux to the “cold” side of the test fixture. If we supply the whole system it comes in a 19″ rack full of instruments and with a control programme running on a Windows PC.